Are you and your kids playing enough? Government physical fitness guidelines recommend that kids ages six to 17 get 60 minutes of aerobic exercise every day and adults should get 30 minutes of aerobic exercise a day. It's easy to stay active when you play: Try out these ideas for local activities that can keep your family moving and having fun! Founded in 1844 as a safe refuge for local tenement boys, the YMCA continues its tradition of caring for communities even today. You'll find exercise, nutrition, and parenting classes as well as a variety of activities and meet-up opportunities for adults and kids that promote safe and healthy communities. Thanks to the YMCA, your entire family stays active, and you'll meet people like you who are committed to play. Facebook offers more than an online tool to stay connected with family members and friends or play games. A few years ago, I organized a local parents group on Facebook, and we arranged play dates, organized game nights, and shared outing ideas. The friendships I've built in our Facebook group enrich my life and help me play more! I highly recommend you find or start one today. In my area, local municipalities are in charge of public playground maintenance, but that doesn't prevent people from littering. My girls and I decided last year to adopt a playground near our house. It's fun and rewarding to keep our playground clean, since we and other families can enjoy it after we're done. Is there a playground near your home that you and your kids could adopt? Some dogs like to make friends with everyone they meet, so head to your local dog park as a family. Your furry friend will get exercise, and you'll meet fellow dog owners who also love to play. Are you like us and don't have a dog? My girls and I always make new furry and human friends during our regular dog park visits. When my girls were little, we attended preschool story time at our local library. They enjoyed the story and activities that promoted play. Today, our library offers even more programs for families, including a summer drama program and children's craft hours. You can also create a scavenger hunt that requires your kids to search the library for different books, pictures, or information, offer to teach a playful class on weekends, or form a kids' or adults' game club as you play at the library. When I was a kid, our local community center hosted fundraising dinners for the fire department and other social events. We're privileged in our current community to have a center that also offers after-school tutoring, senior activities, and family game nights. If you don't have a community center near you, check out your local senior living centers, housing developments, or churches to meet new people to play with! 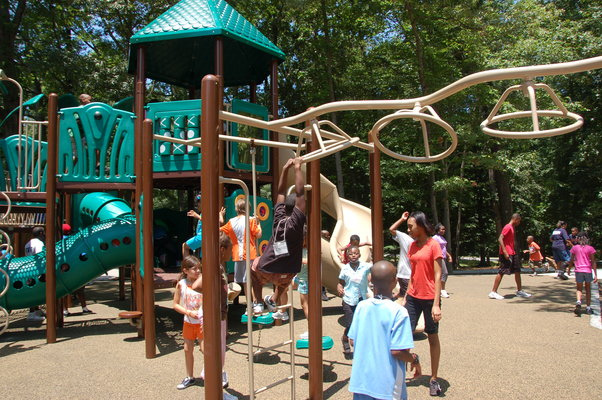 Many local communities offer a variety of play opportunities, but what if yours doesn't? I challenge you to take action and introduce more playability in your area. Research organizations like Kaboom! that are dedicated to community play, then engage with community leaders as you discuss ways to offer more play options in your area. Be the change you want to see when you take action to introduce playability in your community. Play is important for your kids and you. Are you getting enough play? These seven ideas can help you find more local play opportunities as you stay active and have fun together.